Apple's iPad created a market seemingly out of nowhere, and now everyone and his dog is trying to get a piece of the market it spawned. It's interesting to see. Heck, I've wanted a tablet since I saw them being used by Frank Poole and Dave Bowman in Stanley Kubrick's 2001: a Space Odyssey. So it's about time. And is isn't that Apple's juggernaut fell from the sky unannounced. Various tablet computers have actually been around for years, but Apple's "expanded iPod/iPhone" eschewed complete computer functionality to tailor its concentration on things – web browsing, email, e-book reader and the like – that exploit the portability and connectivity rather than raw computing power. I've reviewed a couple of competing tablets so far, of both the Windows and Android persuasion, but I have yet to find one that gives me the urge to skip my iPad across a pond. But I keep looking – not because I want to get rid of my iPad (which is like another appendage) but because I'm curious to see how others pull off their own variations on the theme. Oh, and it gives me something about which to write. In this column I'm focusing on three Android-based competitors, one full-sized and two that are more compact. All work as advertised for the most part, and each has its benefits. First up is Acer's Iconia Tab A500, the company's first tablet to run Android version 3.0 (called Honeycomb). It looks very similar to the Windows-based one I tried several months ago. One difference is that this version doesn't come with a separate keyboard you can use to turn the tablet into a netbook, but with the availability of many Bluetooth keyboards on the aftermarket I don't find this a flaw at all. For example, I'm also reviewing Zagg's new ZAGGKEYS keyboard right now (Acer sells its own Bluetooth keyboard separately as well), which not only works fine with the Acer but which also comes with a little stand you can use for perching the tablet at a nice angle. The Acer Iconia Tab A500 tablet comes with a 10.1-inch touch screen that, unlike my Android phone, isn't prone to loading apps seemingly by merely thinking about them. This is a good thing; I find the touchiness of my phone annoying. The Acer also gives you access to HD content in high resolution (1280 x 800) and of course you can access thousands of apps in the Android Market. The soul of the A500 is the NVIDIA Tegra 2 1GHz dual-core processor and integrated GeForce GPU that Acer says lets you do HD gaming, browse the Internet faster, run multiple applications, digital media playback and flash apps. The nice and slim (it weighs only 1.7 pounds) unit's screen works very nicely – not too sensitive and not so insensitive that getting it to do anything drives you nuts – and it also offers a good viewing angle. You can view up to 720p video, which is fine on a screen this size, and share audio and video (up to 1080p, they say, though I didn't try it) via its HDMI port. 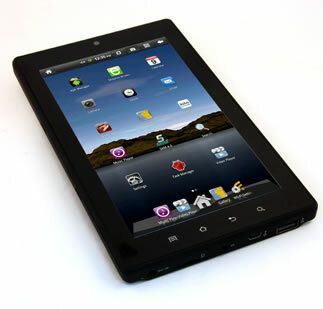 The Iconia Tab A500 also comes with a 5 megapixel, rear-facing auto focus camera that lets you capture video and images. A two megapixel fixed-focused front-facing webcam can be used for stuff like Skyping, video conferencing and recording HD video and comments for YouTube and Facebook, if you're into such things. Battery life is good – Acer says it gives you up to eight hours of playback for "casual games" and HD video playback, and up to 10 hours of WiFi Internet browsing. I didn't actually time the battery life, but those figures seem reasonable. In fact, all the tablets under discussion here offer good battery life. The Acer supports up to 32 gig worth of MicroSD card and offers Bluetooth and Wi-fi connectivity, Dolby Advanced Audio v2 Audio Enhancement, support for high definition audio, a regular sized and a micro USB port, a micro-HDMI out port, and the other usual I/O's such as 3.5mm jack. The Iconia A500 starts at a MSRP of $349.99, which seems pretty decent. TheNextBook Premium 7 is the seven inch size of NextBook's Premium series, surprisingly enough. The company also offers screen sizes of eight and nine inches in this series. The Premium7 is a very nice, sleek design that fits nicely into your hand or pocket (depending on the pocket's size, of course). Naturally, you can use it to surf the net, play games and music, or watch video. Its seven inch color display looks good – and you can use its built in Kobo app to read the 25 free eBooks it comes with. The Premium 7's capacitive screen is also works well, not too jumpy and not too insensitive. The NextBook also comes with ASTRO File Manager, SlideME Application Manager and OfficeSuite Viewer, the latter of which lets you open MS Office documents, PDF files and attachments. The ASTRO File Manager lets you do such things such as copy, delete, move and rename files on SD cards. E-Fun (NextBook's parent) says the Premium 7 tablet's brain comes via a one GHz processor and includes built-in speakers and four gigabytes of memory, which you can enhance via SD card. Of course you get Wi-Fi, and there's a photo viewer, notepad, calendar, alarm clock and music player. There's a mini-USB port as well. The Premium 7's screen's resolution is 800 x 480, which ain't HD (though it'll play HD files) – but in my never humble opinion HD would be wasted on a seven inch screen anyway. Besides, the videos I watched on it looked fine. Updates show up via prompts on the screen. Battery life is advertised as up to seven hours for music playback and six for video or surfing. This also seems more than adequate for most uses. One thing I think is a big oversight is the lack of Bluetooth connectivity – so you can't stream music to, for example, a Bose SoundLink or other such Bluetooth speaker. You also can't use a Bluetooth keyboard, either, which is a darn shame since a seven inch screen doesn't offer a lot of real estate for the onscreen keyboard, even in portrait mode. Heck, I didn't like the onscreen keyboards of any of these tablets – and I'm not a huge fan of the iPad's, either, though I like it slightly better than these three Android tablets'. There's also no camera built in, nor is there a microphone or GPS capability. None of these oversights would bother me – I have a digital camera I prefer anyway, plus a smart phone, and I don't use my tablet for such tasks anyway (well, GPS sometimes). Naturally, your mileage may vary. The Nextbook Premium 7 Android tablet retails for $250 U.S., and even comes with a nice little carrying bag. It's easy to use and works well, within the limitations outlined. I'd rate this one as my second favorite of the trio. Then there's the Leader International's new Impression 7, the little brother to the Impression 10 I reviewed a few months back. I liked that unit, but found it a tad bulky and hated the screen because you just about have to pound on it before it'll acknowledge your touch. I hoped that this new model would eschew that screen flaw. Alas, it wasn't to be. 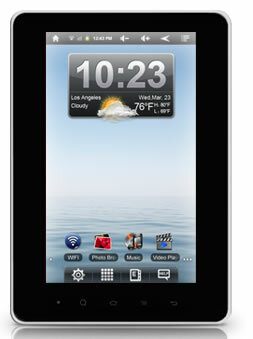 The Impression 7, as its name implies, comes with a seven inch screen. The manufacturer says it's a resistive TFT display at a 800x480 resolution. The tablet comes with Android 2.2 OS, a .3 megapixel camera and plenty of other features such as a one gigahertz processor and a half gig of RAM. It also comes with four gigabytes of memory, Wi-Fi, two USB 2.0 ports and a Micro SD slot that supports up to 32 gigabytes of storage. Battery life is claimed at up to six hours "of play" and the Impressions 7 comes packaged with charging and USB cables, data transfer cable and a "kickstand." Alas, there's no Bluetooth built into this one, either. It does comes with a really nifty case/cover that makes it look kind of like a daytimer, which of course it can be if you want it to. The Impression seems to take quite a while to boot up, though it's really not that long; I think what makes it seem long is the series of promotional screens it inflicts upon you as it boots. I couldn't figure out how to shut them off so you may be stuck with them. The unit itself performs fine, and works pretty much like the other Android units here, but once again I found the screen to be really annoying. Perhaps the fact that it's called a "resistive" screen might explain why it resisted my touch so much, but that screen insensitivity would be a deal breaker for me. On the other hand, a friend and my wife both tried using the Impression and, while they didn't like the screen sensitivity, either, both said they could live with it. Then there's the unit's very reasonable $180 price, which could be an attractive incentive. Of the three units here, I preferred the Acer, which may surprise no one considering it's also the most expensive of the trio. It's also the largest, more closely approximating the iPad's size. I was hoping the seven inch units, both of which fit into my jacket pocket nicely, would be good enough to compete with the iPad, just in a smaller package, but I didn't find that the case. Naturally, the price points enter the picture here, indicating that you do, indeed, get what you pay for. On the other hand, if you're looking for a small tablet with more limited features – and don't care about such stuff as Bluetooth – these seven inch units could perform well for you. Think of them as like an e-book reader (both come with Kobo), with stuff like Internet, music and video capability included in the price.